Charvers consider college to be cool, but not school. 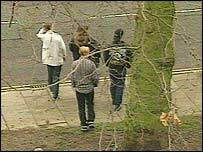 Gang culture in the north east of England means teenagers deliberately fail exams to stay cool, a study says. A poll of 4,000 Tyneside teenagers says peer pressure stops many pupils from studying or taking part in lessons. Researchers say so-called "charvers" reject school as uncool and refuse to do GCSE course work, meaning they fail their exams. They say the situation could be the same across other UK cities, although the groups might have different names. The charvers typically wear fake designer and sports gear and are usually from poor backgrounds. Researchers questioned teenagers aged between 15 and 17. They found the charvers' attitude was that school was uncool but college was OK, and that most expected to re-sit their GCSEs at futher education colleges. The research was by Lynne Howe, director of the South Tyneside Excellence in Cities programme. She said: "For some youngsters - those known as charvers - being cool and well-thought of among their peers is the most important thing. "These youngsters were largely from a deprived population but they didn't lack confidence or self-esteem. "They deliberately fail their GCSEs because their social standing outside of school is more important than any qualification. "They were scared of being called names, physical threats and damage to the family home and property if they were seen doing homework or answering questions in class, but they consider college cool." The former teacher said the teenagers identified five different groups in school, including charvers, radgys (more aggressive than charvers), divvies (impressionable hangers-on to the charvers), goths (wear dark clothes but often work hard) and freaks, who work hard and are considered "normal" by teachers. Nearly a third of the 15 year olds said they had been picked on for doing well at school, while the same proportion admitted teasing others who participated in lessons. More than 90% of bright pupils said they wanted to go to university but only one in four said they were doing their best at school. Some said they would rather fail their GCSEs and take resits at college, hoping to get into higher education later, than risk being targeted by bullies while still at school. The teenagers said they would like to be taught in groups not dependent on ability but on attitude, so those who wanted to work could do so. Lynne Howe said this idea came from both the charvers and the others. "The most important lesson to be learnt from this is about classroom management and school discipline and the expectation that children will work outside school." She said charvers were prepared to do college work, so perhaps schools could consider setting a termly project rather than nightly homework. Mrs Howe also suggested teachers avoid asking pupils to put their hands up to answer questions and set more group work because it was less divisive. She will discuss her research at a conference on young people's attitudes to education run by Northumbria University and the North East Assembly on 17 September.